Hey readers! 久しぶり which means “long time no see” in Japanese. I’ve been so busy with work lately that I just haven’t had time to update my blog. I’m here to rectify leaving it in blog-limbo as travelling back in time to my last post, it seems that I’m still somewhere in Vietnam. 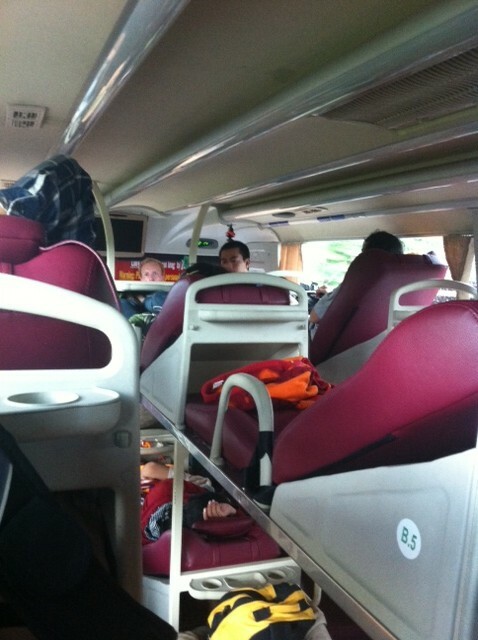 Our helpful hotel in Ho Chi Minh City booked us a couple of seats on the bus to get to our next destination, Mui Ne. 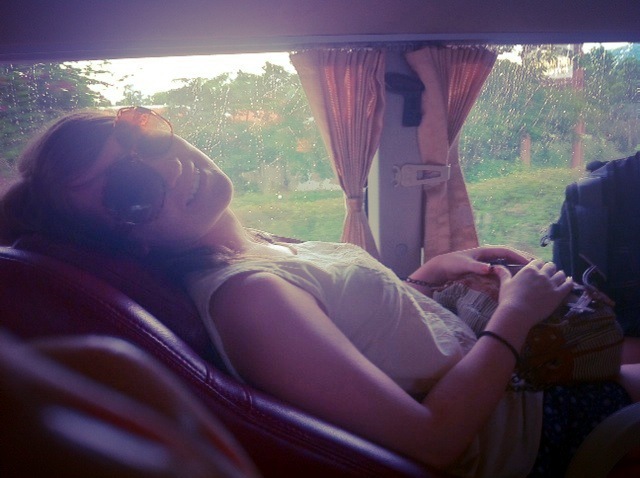 We were amazed to discovered the 6 hour bus journey would only cost us $6! On the day of departure a tiny mini van already crammed with more people than seats picked us up from our hotel. As I squeezed in beside someone’s large haversack I tried to remind myself that we had only paid $6. It was a nice surprise then when the mini bus pulled into a bus terminal just around the corner and we were directed to a coach accordingly. What a relief! The “coach” was like nothing I’d ever seen before. There were no seats, but two levels of plastic “beds” that resembled bucket seats that you’d get in racing cars. As I struggled to climb into my “top bunk” the bus abruptly took off and my rucksack almost came crashing down on a sleeping traveller below. Once I’d got my bearings, I tried to get comfy but there was no denying that we were in for a long ride. Still, it was an exciting new experience and the passing landscape made for interesting viewing. The bus definitely had an original set up. As soon as we left the city boundaries we also left all traces of road and continued at full speed hurtling along dirt tracks until we arrived in Mui Ne six hours later. Mui Ne is basically a tourist built town with miles and miles of holiday resorts and hotels lining each side of the road. The bus would stop ever two minutes to let someone on or off but as there was no announcement it seemed as though we were expected to guess where to get off. We learnt that too late and when the driver finally mentioned that we were leaving Mui Ne, we frantically hopped off and began the 30 minute walk back in the direction we’d came. Using a few choice words along the way, when we eventually arrived at our hotel, all was forgotten. 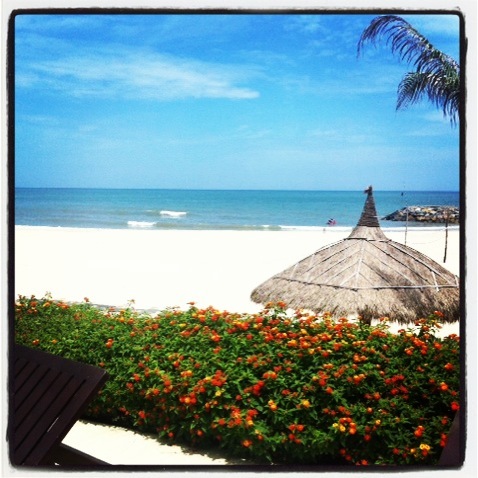 Our stay in Mui Ne was mainly relaxing on the beach and strolling into town for a meal and some drinks. Despite being a purpose-built holiday resort that’s clearly been thrown up in the past few years, a few of the restaurants were some of the nicest I’ve ever eaten in. My favourite was a little German place where I was able to get currywurst and sauerkraut. Very unexpected but absolutely delicious. Mui Ne was the perfect way to end our exotic summer exploits. The final day is one I’ll never forget as for some seemingly magical reason, the beach and pool area were deserted and we had them all to ourselves. It was absolute bliss. I didn’t even have to leave the hotel pool to get this view of our private beach. 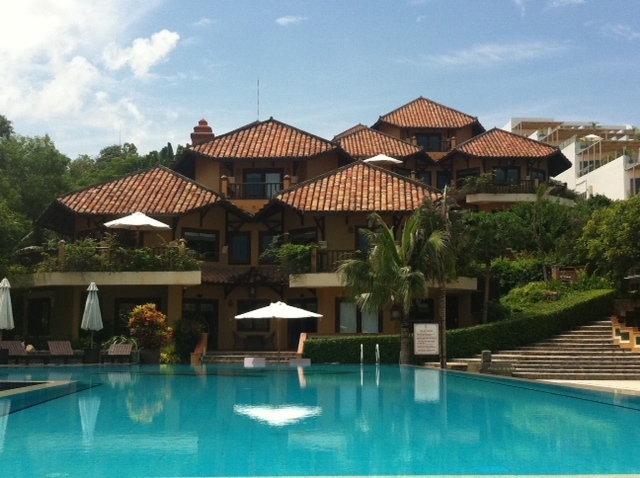 The view of the undisturbed pool taken from my sun lounger. The next day, it was time to pack up our things and start the long journey back to Fukui. Writing this post so many months on reminds me what an amazing summer experience I had. With some good planning, travelling around Southeast Asia was much easier than I’d expected and it’s set a very high bar for my future adventures.